Brick Lane, like everywhere in London, is changing. Once famous for its curry houses, you would struggle to find a Tikka Masala before you hit Truman Brewery half way down the lane. The top end is now filled with cafes, vintage stores and, well, more vintage stores. In fact there’s so many vintage stores you suspect that clothes are just recycled between the stores, occasionally landing on the narrow shoulders of some artist before being dropped off again. However, among these stores are a number of great cafes. 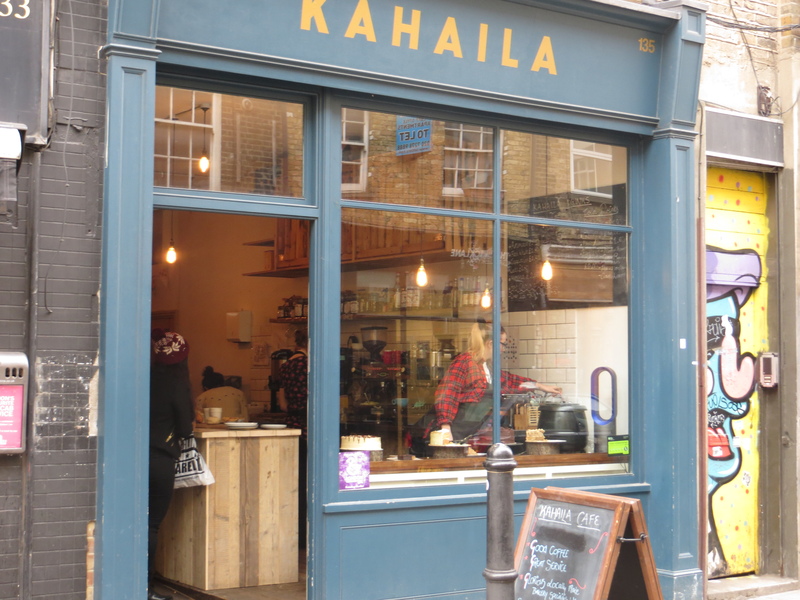 The choices are many, but one of the most recommended on the Twitter-sphere was Kahaila Cafe. A great cup of coffee. Creamy and strong, but drops points for not having the strongest of tastes. However, the flavours do build up after a while and develops very subtle soft caramel tastes. At £2.50 it’s a good deal as well. This is a great hang out place with an interesting clientèle will to share tables and chat. What looks like a small café from the front, once you’re inside it expands out to a large room filled with tables – some for two, some for sharing. 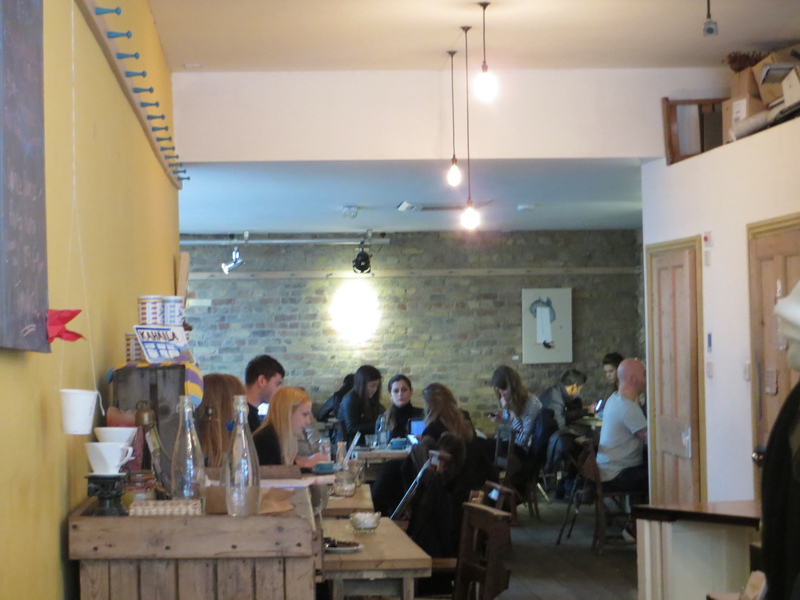 It’s full of the expected Brick Lane types and has the requisite bare bricks and wooden tables. It feels like a place to spend a long afternoon. 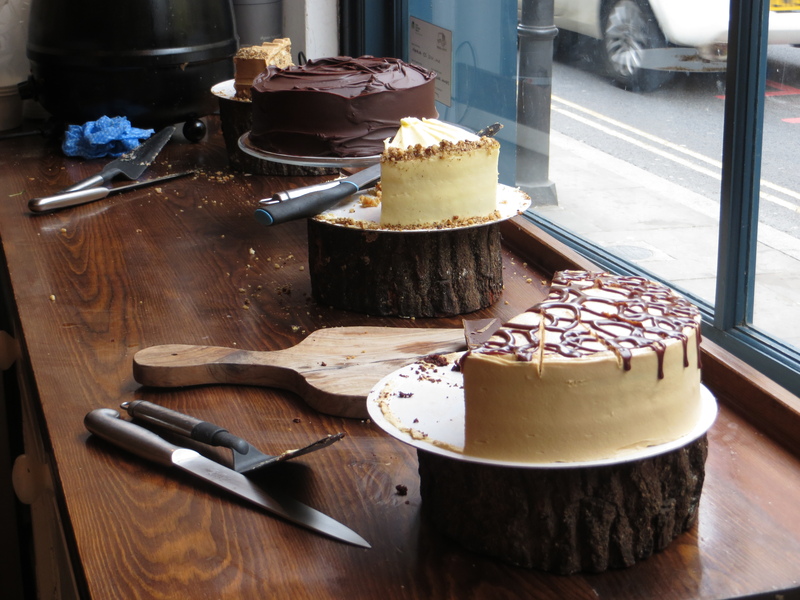 Apparently the red velvet cake is its speciality, and it did look tempting along with other cakes at the front. The sandwich menu is fairly limited and the only other savoury dish seemed to be soup. Again, a little imagination or a bit more choice would have been appreciated. While the service here is great, done speedily and with a smile, I’m marking it down one point because of having to give your name to get a coffee. I realise it’s a big, busy café but it feels like forced familiarity as opposed to making it a more efficient system. I’d rather just wait and take my coffee to the table. 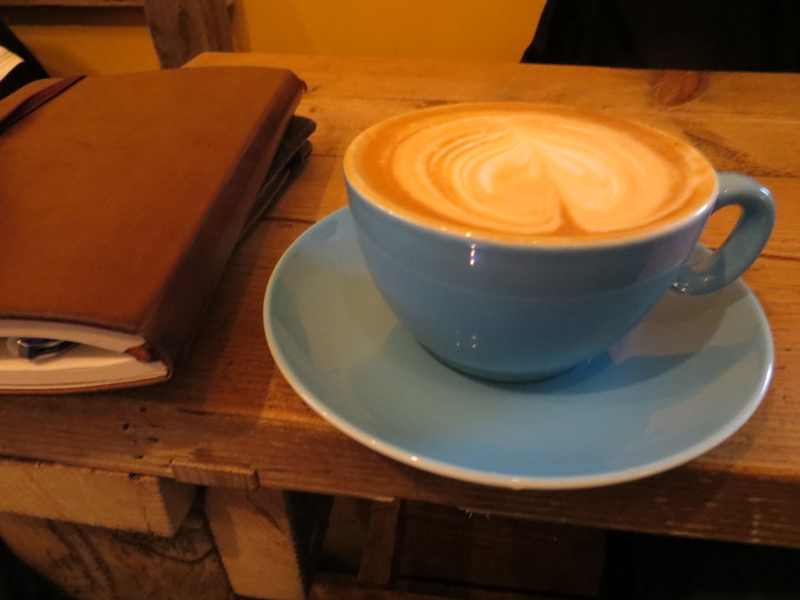 I might not be with the majority here, but it’s a trend in cafes that I’m not fond of. This place has everything including lots of cool stuff for sale, including art, post cards and cups and lives events throughout the week (even a church night on Wednesdays). But the real added extra here is that it’s run as a charity with all profits going to support community projects. They’ve managed to make charity and religion cool again and bravo for doing so. Not only is this a great venue with excellent coffee, but you can also drink here with a clear conscience. Not only not a big nasty chain but it goes the extra mile by supporting local charities.